Scott Investigations & Legal Services is staffed by former police personnel, many of which are former Regional Crime Squad Detectives. Highly experienced in all types of routine and major investigations. Each operative has extensive surveillance skills. 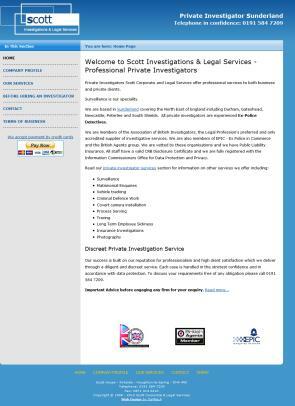 Scott Investigations & Legal Services specialises in assignments involving surveillance. We use the latest equipment to get you results. Scott Investigations & Legal Services provides a range of investigation services for the legal sector, businesses and the general public. Scott Investigations & Legal Services is licensed with the Office of Fair Trading and registered with the Data Protection Registrar. With headquarters in Houghton-le-Spring, Scott Investigations & Legal Services is ideally located to cover from Middlesbrough in the south to Blyth in the north, including Durham, Sunderland, Washington, Newcastle upon Tyne, South Shields and surrounding areas. As investigation and surveillance specialists Scott Investigations & Legal Services also work on major assignments further afield.